Choosing the best solar pool cover is always a daunting task. However, once you understand the various factors that you should consider and know your preference, the process becomes easy. Here is a buying guide to help you get started with this critical process of covering your swimming pool. 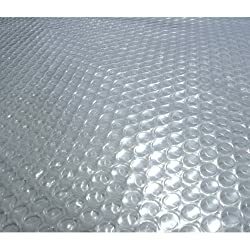 Solar Blankets – These covers are also known as Bubble Solar Covers. They conserve energy, minimize heat loss, are lightweight, very affordable, and quite efficient. On the flip side, they cannot act as safety covers. Solar Rings – They are more expensive and less efficient than Solar Blankets. They are easy to install and reduce energy costs. Liquid Solar Covers – These are chemical liquids that are added to your pool. They are affordable and biodegradable. On the downside, they don’t prevent debris and leaves from falling into your pool. Quality – Ensure that you pay attention to the material used to make the cover. The difference between a bad and good material can determine the life of your pool cover and ability to retain heat. Color – The color will determine if the cover will trap the heat. Darker colors trap the heat best but they can have the opposite effect if they are too dark. Get a semi-transparent cover. Thickness – Thicker covers do the job better and even last longer. However, you might need to pay more to get these types of covers when compared to thin ones. Design – Solar pool covers come in different patterns and shapes. Common designs include bubble wrap-like bubbles, diamonds, and hexagons. Although the sizes are different and the designs might vary, there is no major difference when it comes to shapes. Here is a review of the top solar pool covers on the market today. 1. 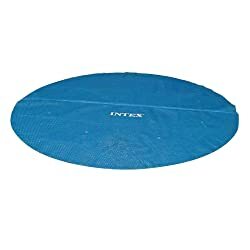 Intex Solar Cover for 10 ft Diameter – For Above Ground Pools. Intex Solar Cover for 10 ft. Diameter is a convenient cover for your pool. The product is uniquely made and designed for a 10 ft. diameter pool. Its major features are the air bubbles which take the heat to every corner of your pool. Additionally, the cover minimizes evaporation by 95% and it maintains the high temperature of the pool; hence, you don’t need to heat your pool using heaters. The cover also has some unique drain holes that remove rainwater from its top to prevent tear due to pressure. 2. 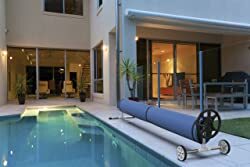 Blue Wave NS510 14-mil Solar Blanket – For Inground Pools. 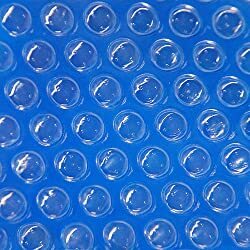 The Blue Wave NS510 is made of air-filled material/cells, what is commonly known as bubble wrap. It is easy to install and remove and very effective as well as light. This particular cover is huge enough to cover the majority of inground swimming pools. 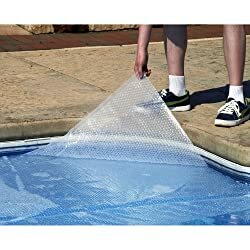 One thing that you should do is to ensure that your pool is totally covered due to the hundreds of bubble wraps present in this cover. This cover keeps your pool warm during the cold summer season and cloudy days. That’s mainly thanks to the Blue Wave NS480’s thermal cell technology that uses insulating bubbles to trap the heat for warming your pool. Actually, the cover increases your pool temperature by about 15 degrees F, making it ideal for heating. Another feature of this cover is the ability to withstand UV light due to its UV-protected polymer. It also minimizes evaporation by at least 95%. Just like the NS480, the Blue Wave NS100 features insulating thermal cells that trap the heat to warm your pool. It also features a UV-protected polymer that resists deterioration due to the harmful UV radiation. Furthermore, it raises your pool’s temperature by about 15 degrees F and minimizes evaporation by 95%. The main difference between the NS480 and the NS100 is that the latter comes with a 3 years warranty while the NS480 comes with a 5 years warranty. This cover for inground pool fits a pool of up to 20 ft. wide by 40 ft. long. It is made of stainless steel materials to ensure durability and is corrosion resistant and rust-free. Another great feature of the cover is its ease of installation since it comes with large wheels for maneuvering. Very effective, the pool cover comes with 8 clips and straps for holding it in place. Harris 12 ft. x 18 ft. offers fantastic heat retention at no extra cost (heating cost). In fact, it increases your pool temperature by about 15 degrees F and prevents water evaporation. This means that you don’t need to keep on adding chemicals to your pool due to water loss. With an easy hassle free assembly, you won’t waste your time when installing it. One unique feature, it allows the sunlight to penetrate to your pool surface in order to prevent algae development. 7. 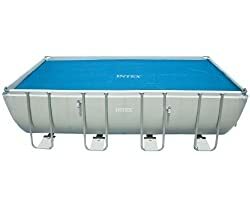 Intex Solar Cover 18 ft. x 9 ft. Rectangular Frame Pools – For Above Ground Pools. Intex 18 ft. x 9 ft. was made and designed to fit a rectangular pool with the said measurements. It is made with 160 micron that ensures the water in your pool is always warm and ready for a swim. Also, the cover comes with a carrying bag that provides you an easy time when storing it. Weighing about 5½ pounds, this cover is pretty light. Hence, it won’t put pressure on your poor and it offers value for money. 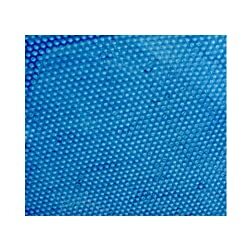 This cover is made of UV-stabilized resin with hundreds of air bubbles that transfer the sun’s heat into your swimming pool. It also prevents this heat from escaping, ensuring that you get a warm pool during the chilly nights. Also, the In The Swim 12 mil helps to prevent chemical loss by preventing evaporation. And, it comes with a 7 years warranty and is quite easy to trim or cut. Splash Pools Oval Solar Cover measures 24 ft. by 12 ft. to ensure that it covers most pools. It is made of high-quality resin and features hundreds of air bubbles that trap and transfer the sun’s heat to your swimming pool. As well, this cover keeps your pool cleaner as it prevents debris and dirt from falling in. Another great feature of this cover is the ability to prevent water loss by 95%. 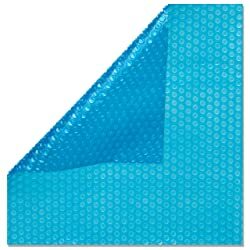 It also raises your pool’s temperature by 15 degrees F.
The In The Swim 8 mil is a must have cover for any swimming pool to save you money, energy, and time. The cover is made with quality flat seams and tiny air bubbles that capture and take the heat to your pool. It also helps to prevent the heat from leaving your pool and also prevents water loss. With this cover, you can extend your swimming session into an environmentally friendly pool. It is also very easy to trim the cover and it comes with a 3 years warranty. What Are the Benefits of Solar Pool Covers? As well as warming your swimming pool, these covers provide some money-saving advantages. Reduce Evaporation – These covers reduce evaporation by at least 95%. This prevents chemical loss and hence the cost of replacing them. In fact, the best cover prevents about 35-60% chemical loss. Retain Heat – During the chilly nights, solar blankets prevent the heat from dissipating from your pool. Hence you don’t need to run the heater as frequent as you would do without a cover. This saves you energy cost. Keep Debris and Bugs Out – Although not their main purpose, these covers shield your swimming pool from debris and bugs. This means that you will only need to run your pool’s pump a few times a month to remove any debris that might have entered your pool. Hence, saving energy cost. Q: How does a solar cover works? A solar pool cover functions like a lid. It captures the heat from the sun and prevents your pool from debris and dirt. It also prevents heat loss as well as the water from evaporating. Q: How long does a solar pool cover last? Because a solar cover is made of plastic material, it will begin to deteriorate after a while. Also, because of the elements and chemicals in your pool, the cover will begin to dry around the corners and the bubbles will start to deflate. These covers can last for about 5 years. Selecting the best solar pool cover is always an easy process if you understand what you need. Although we would recommend you to try the Blue Wave NS510 14-mil Solar Blanket, the other 9 covers we have reviewed are of top quality and will offer value for money.